Katie's baby spends a lot of time in the family room, crawling around the fireplace. Her husband applied black foam to make the hearth's brick edge less dangerous for Killian. 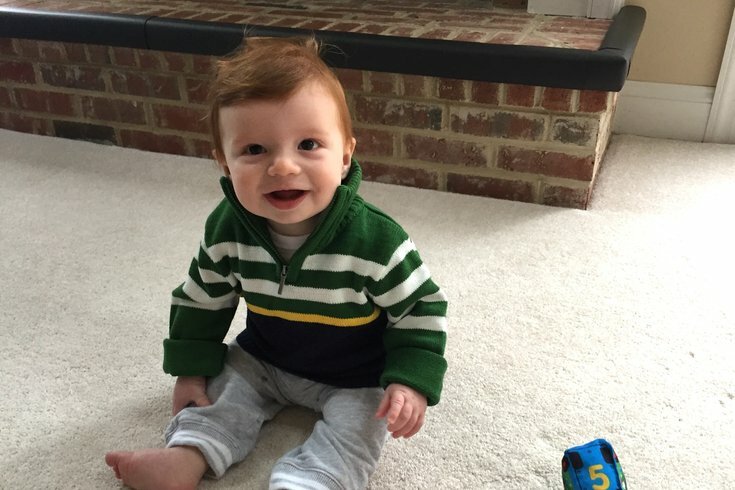 At Killian’s 4-month checkup, his pediatrician advised us to begin baby-proofing our home. I was surprised that we needed to do this so early, but the doctor explained that as soon as a baby can roll, it is time to safeguard him from potential dangers in the home. She said it is wise to start protecting your little ones before they start crawling, climbing and walking. As soon as we got home, I grabbed a bag of outlet plugs and got to work. It is amazing how quickly a baby can become interested in stairs! We are installing baby gates at the stairs in our home to prevent Killian from trying to crawl, climb or walk up or down. Falling is a major source of injury for little ones, so pay special attention to preventing your child from accessing the staircase. Double check that all your windows properly lock and the screens are secure. Never leave your baby unattended near an open window. If your window sills have sharp edges, you should consider covering them. Always keep shade or curtain cords well out of baby’s reach. All heavy furniture should be mounted into a stud in the wall to prevent it from tipping or being pulled on top of your child. Most heavy furniture these days comes with hardware to bracket the piece to the wall. If not, visit your local hardware store and ask for some guidance. It is a very good idea to hang your television, too, as a tipped or falling TV is a leading cause of injury and death in babies. We have a raised, brick hearth around our fireplace and a wood coffee table in our family room that had DANGER written all over them. Because Killian spends so much time in this room, we covered the edge of the hearth with a black foam rubber and are buying corner guards for the coffee table. When we recently purchased a new ottoman, we went with a soft leather one that is baby friendly. Some rooms should be completely off limits to your baby. There are safeguards that you can attach to doorknobs to prevent your child from opening doors that they shouldn’t. While Killian cannot yet reach doorknobs, we are preparing for the day when he will by purchasing some of these devices. There are a lot of hazards for baby in your kitchen, so this room requires extra attention. Keep your dishwasher locked at all times. Just in case, when loading your dishwasher, put the pointed end of any utensil face down in the basket and wait until right before you run the dishwasher to put in the detergent. Make sure your stove knobs are safeguarded and always turn pot and pan handles in when cooking, even on the back burners. Ensure all breakables or potentially dangerous items like glass bowls and knives are stored away and well out of baby’s reach. Keep all low cabinets and drawers latched to prevent your little one from opening them. Even if you don’t think some of your cabinets contain hazardous materials, it is prudent to keep all locked. There are a number of cabinet safety latches on the market that allow adults easy access while protecting your baby. While most cabinets and drawers are located in the kitchen, check out your whole house to ensure all of them are properly secured. Pay special attention to any cabinets or drawers that contain cleaning supplies and breakables. A small child can get into things so quickly! So make sure that all hazardous items in every bathroom – like shampoo, razors and medications – are out of baby’s reach and put away. Installing latches on your bathroom drawers and cabinets as well as a lock on your toilets is prudent. We are also purchasing a cover for the tub faucet to make bath time safer. Always remember to never leave your baby alone in the bathroom or near any water. Every outlet in your home that is not being used should be plugged or covered. Outlet plugs are inexpensive and easy for adults to install and remove, when needed. You can also purchase special outlet faces that have a built-in safety guard. Covering your outlets will prevent your little one from the risk of electrocution. Our pediatrician singled out wires as a major issue for rolling babies. Just because they cannot yet crawl, does not mean that they cannot roll into wires. We had a jumble of wires connected to our TV and entertainment system in our family room that my husband has organized and put out of reach of our son. Every other wire is being attended to and kept out of Killian’s way. A woman in my MOMS Club® recently shared a story that helped me identify a potential baby hazard that I previously overlooked. One night her baby girl was able to reach through her crib, unplug her baby monitor and wrap the cord around her neck. Luckily, her mama responded quickly to her cries and was able to prevent a tragedy. After hearing that story I scanned the outlets that are near Killian’s crib and decided to move his night light sound machine (and its wire) to another outlet further away from his crib. A few other things to keep in mind to keep your baby safe in his crib: Only use a fitted sheet and do not put any pillows, blankets, bumpers or stuffed animals in baby’s crib. It is recommended that you buy a new crib to ensure it meets today’s safety standards. And check to make sure that the mattress is low enough that baby cannot get out of his crib. We just had to lower Killian’s mattress from the highest to the middle brackets since he was starting to pull himself up. If your baby is like mine, he is going to go after everything that he shouldn’t. He will bypass his favorite toy every time for the coffee cup that I set down for a minute. I do not want to scrub my home of everything that Killian could turn into a weapon – we would live in a practically empty house – but I do want to ensure he is safe. His health and wellness are the most important things to my husband and me, so we are doing our best to keep everything that we do not want him to touch well out of his sight and reach while also using the tips and devices I mentioned to keep him safe. We also never leave our baby unattended while he is awake. Diligence and attention are the best prevention. How did you manage the overwhelming task of keeping your baby safe in your home? Share with me and other parents in the comments section below or tweet me @ThePhillyVoice and @KathleenEGagnon.